It’s been a while since I updated my blog to reflect anything going in my current life. I aim to remedy that now. In May of this year we decided to move out of the house we’d lived in for the last 20 years, on a ranch in the middle of nowhere, into a mobile home, and go mobile for a couple of years. We’ve started another blog, Roaming the Backroads, which I invite you to visit, detailing our travels. We are still working, mind you, but we are doing it from the road. We are NOT retired. Our clients can depend on us to continue with our ongoing projects and new projects as they come along will get done. 2. We moved into a 36-foot diesel pusher motor home – a “Classic, High-Tech Edition” 1987 Beaver Marquis with exquisite oak cabinetry everywhere inside. It needed a lot of work to fix leaks and seals and so on, but we just tackled one thing at a time until the list was done to make it road-worthy and livable. 3. We traded in our un-towable Rav-4 Toyota car on another car that is light and tow-able by the motor home (a cute red Chrysler PT Cruiser we call “The Toad”) – this required installing a Roadmaster tow package on it that cost nearly a third the price of the car itself. It lets us tow the car behind the motor home with almost no worries. 4. We hit the road on August 10th, 2015. 5. We got married (in Las Vegas, baby!) on the 2nd of October in a private ceremony. That was a long time coming — I first asked Marie to marry me in the spring of 1973, when she was 17 and I was 19. There’s been a lot of water under that bridge…. We have high-speed internet connections through Verizon 4G most of the time, on an unlimited data plan, so that we can work on the road. It’s about as fast and reliable as the internet we had on the ranch. When we pick campsites, we depend on an ap to tell us whether we’ll have coverage. So far it’s been quite accurate. The ap is called “Coverage” and we recommend it. We have a built-in Onan generator that runs on propane, to provide 6500 watts of power when we are sitting out in the middle of nowhere (as we are now) “boondocking”, as it is called. We brought our big computers with us, but only half our monitors. It’s been a struggle to adjust, but I think we’re there. I no longer miss monitors 3 and 4 every time I turn on my computer. And I no longer feel like I should have sold the big computer and downsized to my laptop. I’ve been taking a lot of photos. 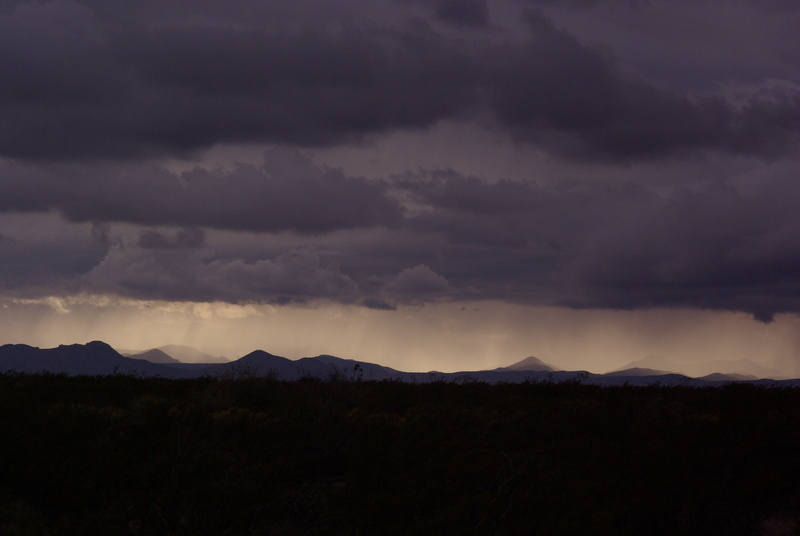 Here’s a photo from the wilds of New Mexico yesterday near Truth or Consequences – where it has been raining. We’re on our slow way to Florida to visit with children and grandchildren around Christmas-time, taking plenty of time to work between “travel days” and stopping to see the sights at places like the Grand Canyon, Zion National Park, and Arches National Park. A few days ago we were chatting with Navajo knappers (aka “chippers of obsidian or flint arrowheads”) at Four Corners National Monument, about where they get their obsidian for the arrows. Apparently they’ve been trading with people who live near the obsidian fields close to Bend, Oregon. This trade has been going on for many centuries, as it turns out. Currently they get boxes of it by pickup, from people who want finished trade goods in exchange. Or they drive up to Oregon and buy it directly or harvest it themselves from the lava flows. We’ve been de-compressing, simplifying, and very much enjoying life on the road.